Sooner or later, we all make the mistake: We're having a little too much fun on a ride and get into a turn too hot. What are you going to do? If you don't know ahead of time, you won't figure it out in the split-second moment of panic you feel when you realize the turn is sharper than you think, or you've carried too much speed. If you haven't trained yourself to do the right thing, instincts will ensure you do the wrong thing. In most cases, when a rider blows a corner in the twisties, the rider wasn't using anywhere near the full capabilities of the motorcycle. Almost always, the key to surviving this scenario is to look through the corner toward your exit, lean further and resist the impulse to panic, stand the bike up and brake. When I'm riding on a curvy road and enjoying a brisk pace, I sometimes consciously remind myself: If I get in too fast, just lean more. My hope is that this will train my mind to do the right thing in that moment when I'm tempted to panic and do the wrong thing. This video, which made the TV news in Southern California this week, shows a rider who made the wrong choice. Into the corner hotter than he expected, he stood up the bike and braked. You can see him put a foot out as he heads straight for the guardrail and gets thrown over the cliff. Luckily, the trees he fell into broke his fall and he came out mostly unscathed (though he did get a helicopter ride out of the ordeal). Even more lucky was the fact that he narrowly missed colliding head-on with an SUV. The riders before him and after him both made the corner. He was not going much faster. That means he could have made it, too. What's the lesson? 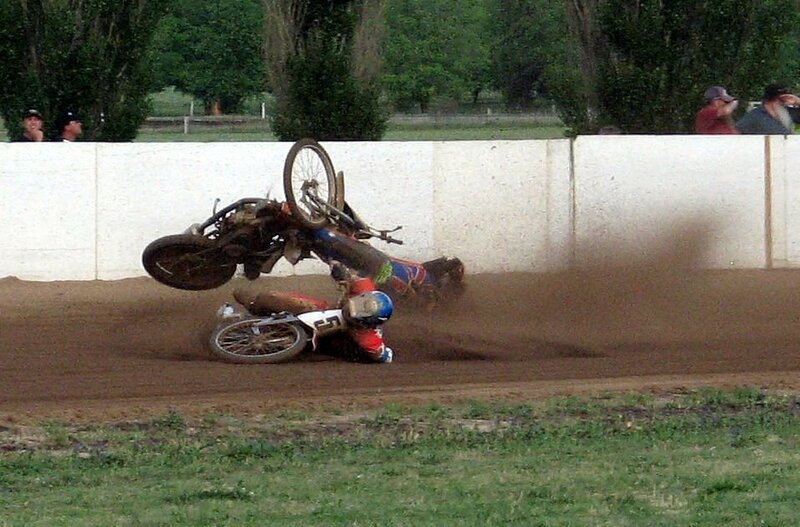 Prepare yourself for the next time you misjudge a corner by training your mind to react the right way, by leaning further and riding out the turn, instead of giving in to panic.